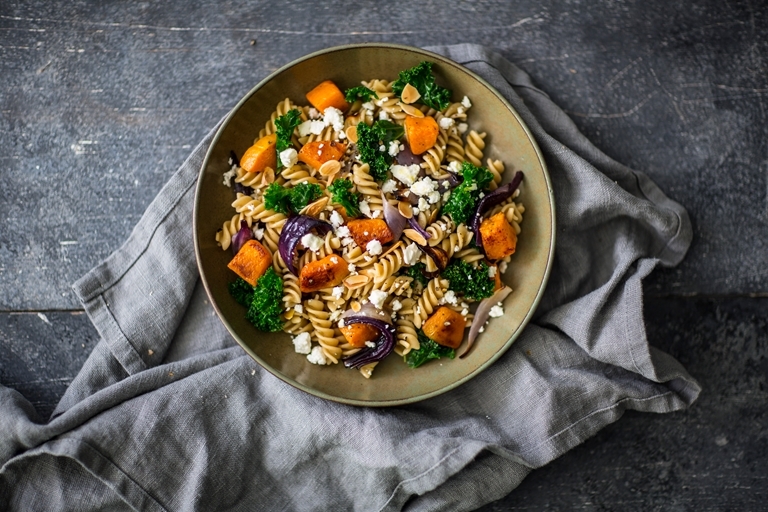 This autumnal pumpkin pasta salad recipe is topped with crumbled feta for a lovely contrasting tang to the sweet squash and onions. Toasted flaked almonds add a pleasing crunch to this brilliant whole wheat fusilli dish. Roasted autumn vegetables are added to fusilli pasta with toasted nuts for a seasonal warm salad that is perfect for as a meal in its own right when served with crusty bread, or as an accompaniment to grilled meat or chicken. You can oven roast the vegetables beforehand and then just add them to some freshly cooked fusilli when you are ready to serve. A scattering of toasted nuts completes the dish with a crunchy finishing touch.